Moon Bingo Review | Get Your £60 Bonus + 20 FREE Spins! If you’re a regular at your local bingo club it’s about time you swapped bricks and mortar for an online gaming experience at Moon Bingo as there’s bingo happening 24/7! If you need more convincing than that then read the rest of our review to find out what else this top bingo site has to offer. The site itself is easy to use, with registration taking just a couple of minutes. You don’t need to make a deposit to get started and will immediately receive 3-days free bingo access. Moon Bingo clearly knows a thing or two about attracting bingo players to the site as there’s a generous welcome offer for newbies. If you fancy getting your hands on £60 of bingo tickets + 20 free spins all you have to do is sign up and add £10 to your account. These tickets give you a great opportunity to check out the £50 Daily Treat and the £2,500 Real Cash games. Your free spins will be added to your account immediately are valid on Starburst. As far as bingo sites go that’s a pretty spectacular welcome so if that doesn’t impress you we don’t know what will! 3 days free bingo on registration – no deposit required. Real money bingo games starting from 1p. Speed bingo and free bingo games. Moonbingo.com has a great online community – you can find them on both Facebook and Twitter. If you’re after some free cash to play with them make sure you head over to the Moon Bingo Facebook page to find a range of exclusive bonus and promo codes, competitions and top offers. So, you already know that you can play bingo from the comfort of your own home but did you know that you can also play when you’re out and about? That’s right Moon Bingo has its very own app and the site is also mobile optimised so you can play bingo wherever you go via your tablet or smartphone. Regardless of what device you decide to play your favourite games on, you’re guaranteed a high-quality gaming experience. Plus, you can use the same login details to sign into multiple devices, which is even more convenient. The main reason why you should join this bingo site is all the top games on offer. When it comes to bingo you want the best and Moon Bingo doesn’t disappoint in that department with a wide range of cool games for you to check out. Whether you’re quite happy playing classic 90 ball bingo or you’d like to try something different all bases are covered here. Best of all you don’t even need to worry about money because there are plenty of freebies for you to take advantage of. Newbies will enjoy 3 days of no deposit bingo on registration. Funded players will be able to play in the free bingo rooms for 3 days after making a deposit, the more you deposit the more rooms you will unlock. The rooms are unlocked as follows, The Biggie (min £10 deposit), The Grand (min £20), The Ultra (min £30) and The Deluxe min (£50). Unlocking one room will also unlock all smaller rooms, for eg if you unlock The Grand with a £20 deposit and you’ll also gain access to The Biggie. Slot players will also be over the moon because the selection of slot games on offer is just as impressive. Among them, you’ll find some of the best games around including the likes of Football: Champions Cup, Ghostbusters, Fluffy Favourites and South Park Reel Chaos. There’s also a wide range of progressive slot games offering you the chance to win big. It’s not just slots that you’ll find in the ‘Instant Games’ tab, there’s also scratchcards, casino games and fruit machines. One thing’s for sure, there’s never a dull moment at Moon Bingo thanks to a huge variety of games to play round the clock and a never-ending array of promotions. 20 free spins on your first deposit. 3-days free bingo games on registration. Daily £1000 guaranteed jackpot game. Deposit methods include credit or debit cards, PayPal, Paysafecard and Neteller. Minimum deposit amount is £5. Minimum withdrawal is £5. Before you make your withdrawal you need to deposit £30 or more. Withdrawal processing time is normally within 48 hours. 4x bingo, 85x slots wagering requirements on bonuses. Email address: Use 24/7 live chat facility on the official website. 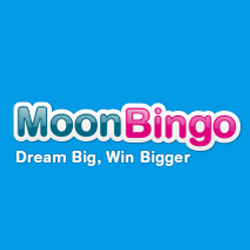 Moon is one of the most popular and established bingo sites in the industry today. They have been around for a while and have had time to hone their offering to provide maximum fun and a decent chance of winning. The new player welcome bonus provides some brilliant value, giving you £60 worth of bingo tickets + 20 free spins when you fund your account with just £10. We can't think of many reasons not to give this site a bash. Great jackpots, top quality games and rewarding bonuses make this a must play at site. Remember, new players automatically receive 3-days free bingo access to registration, so make sure you take advantage of that.